Well, we’re finally in the thick of it. Sorry for the lack of a recent post; we’ve been pretty busy with the start-of-season tasks. Who’d have thought farming could be this busy? (hah) Let’s roll through the latest, one thing at a time. The orchard is on autopilot, for now. The trees are pruned, mulched, and have some sweet chicken manure around the roots. The buds just showed up, and the Gravenstein apples are even in bloom! They are the earliest of the several types we have, and man, do those blossoms smell nice. I don’t really expect to get and serviceable fruit this year, but it’s nice to see such pretty flowers… and the bees like them too. Speaking of my buzzing friends, they are doing quite well, too. The bees and the orchard are bestest-buddies. I’m feeding the hives less sugar syrup as they get more into the groove of getting their own pollen and nectar in their new environment, and they’ve even started drawing comb and putting back honey for their own use. There’s a lot of brood (baby bees) in the cells, too. I did a “mite drop” test last week- that’s where you slip a sheet of sticky board beneath the screened bottom of the hive, and count how many varroa mites fall out of the hive in a 24-hour period. Varroa is a nasty, invasive bee parasite that kills hives if it gets out of control, and it’s decimated bee populations all over North American since it arrived from Asia in the mid 1990s. It’s prettymuch here to stay, and the current thinking on it is that you watch how many are in your hive, and if the number from a sample stays under the “IPM threshold,” you just ignore it, as the bees are getting by OK and the available treatments are often as bad for the bees as the mites. In our region, the IPM threshold is in the mid 20s. 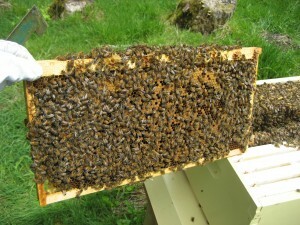 I tested the east hive, and it dropped 7 mites… not bad! However, when I counted the west hive, there were a whopping 54 mites stuck to the board. Wow, I guess that explains why that hive is a little weaker than the other one. Yesterday I broke down and bought some Apiguard. It’s a medicine made from essence of thyme… a naturally occurring substance. This medicine is a kindof new thing, just in from Europe, and it’s less nasty than the chemical-based cures… but you can still smell it and it’s not fantastic for the bees. Unlike the synthetic medicines, though, you don’t have to wait until 30 days after treatment before you can collect honey. The blueberries have leaves now (yay) but aren’t really growing very quickly. 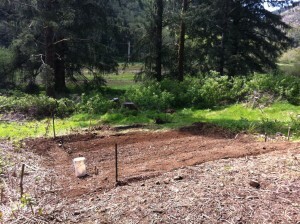 Ryan and I weeded them this afternoon, as the blackberries I cleared out are trying to retake their home turf. It’s tough- Himalayan Blackberries are a vigorously invasive species, and grow from the tiniest stem left in the earth, as well as seeds and rhizomes and buried roots. But it we keep on them, we will prevail. To be honest, I’m ignoring my blueberries a lot lately, which is sad, but this isn’t the time they need a ton of attention, and the vegetable plots are taking all my time…. …because they are a TON OF WORK. “You’ll have to do about a third the work next year,” Ryan said as he surveyed the beds. I can only hope. As it is, I’ve hacked blackberries, grubbed out all the roots by hand, pulled stumps, leveled earth, staked our beds, and tilled everything by hand with a grub hoe. Why this insanity, you ask? Well, turns out that if you mechanically till, you chop up any unfound blackberry roots really finely and distribute them throughout all the soil, where they can regrow to make an already tiresome problem 10 times worse. So I go through every square foot of the garden, by hand, twice. 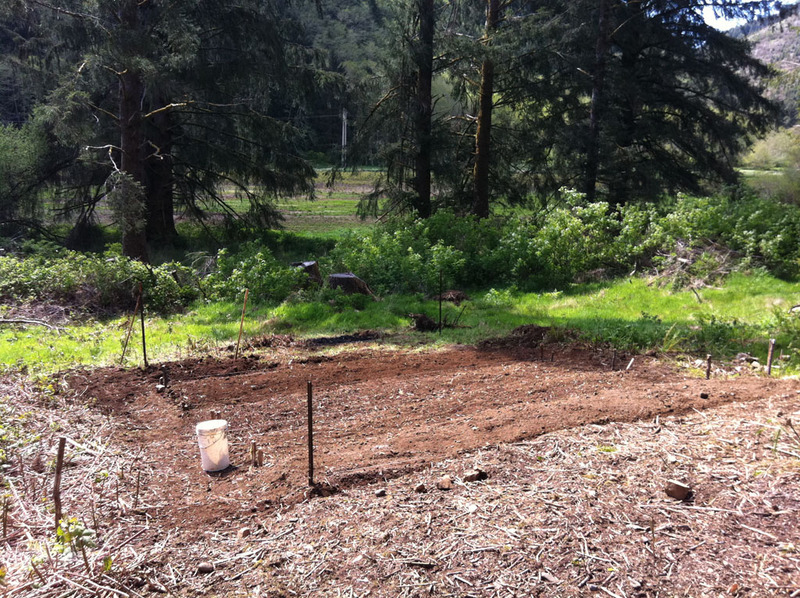 I’ve done about 1,500 square feet so far (you’re looking at 5 beds or 500sf in the picture), and have about 500 to go until I am satisfied… and I will do more, if there is enough time in the season to actually plant something in further beds. I’m thinking radishes; they mature in 30 days. 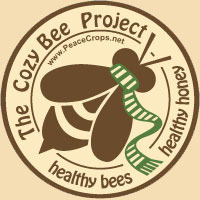 This entry was posted in News and tagged beekeeping, blackberry, blueberry, orchard. Bookmark the permalink.